I think this is the longest I've seen this site go without posting. Even if nothing's going on in the parks, I still enjoy the social aspect of this site. I wish I could get out of the homeless shelter I've been in for nearly 16 months. Last month my suitcase got stolen by a staffer--I have an eyewitness--and now it's in the bottom of a landfill. It's going to cost me a bundle to replace what was in it. Because I fell and sprained my arm 6 weeks ago, I've blown through my sick leave--I'm part-time so no vacation time--and my next check is going to be a little short. Last week they put my stuff on my bed to prepare for power washing the women's section, and a water bottle and spray bottle of bedbug spray went missing. I've replaced those. But still....! There's a special place in Hell for people who steal from the poor. I just learned the staff earns $14/hour--and they still steal? This place is the worst for stealing. If you complain, they all become either Bart Simpson (" I didn't do it, nobody saw me do it, you can't prove anything") or Sgt. Schultz from Hogan's Heroes ("I see nothing, I hear nothing, I know nothing!"). They have each others' backs. So, how have the rest of you all been doing? A fair question. For myself, I've been travelling and cooking, with very little time in the Parks. This past year has included a cruise around South America, another up the Amazon to it's source (where there's good piranha fishing), and a Disney Wonder cruise where one of the engines exploded. Coming up is a road trip to Kansas City, a cruise around South Africa and adjoining countries, and half a world cruise from Hong Kong to New York. The reason for all this is that SWMBO has one steel hip, another on the way, a collapsing spine, and arthritus. She wants to travel as much as she can while she still can. We'll see how far she can go. Since retiring from the Mouse (my, has it been four years already? ), I've taken up cooking. Today's treat for some friends was dates stuffed with an 8 cheese mix, wrapped in applewood smoked bacon, and roasted with a pineapple and hybiscus glaze. Went over well, if I do say so myself. Sadly, my days of wandering the parks observing stupidity are on hold. SWMBO needs a wheelchair, and that makes visits more strenuous and complex, plus standing on queue is right out. Especially in the heat and rain we've been seeing lately. Plus my leash isn't long enough to go without her. So yeah, I'm still here, except when I'm elsewhere. Jut not getting a lot of quality stupid right now. So sorry to hear of your troubles there, felinefan. I'm still coming around here, but it's every few days now, and it seems more and more that there won't be any new posts even if several days have gone by. I still dream that this site will pick up steam again, but I fear the glory days of SGT are behind us for good. I'm still recovering from my Orlando trip with VM and trying to get back into the swing of normal life. I just posted about that trip here. Good times. Had a conference with my pastor yesterday. It's good news on top of good news. First off, the church will cover the part of my next paycheck where I ran out of sick pay, AND will cover the next check after that. Then, they will have a couple of people who work part-time elsewhere come in and do the stuff I can't do yet. My left arm that I sprained in a fall 6 weeks ago is still a little sore. I'm 2 1/2 weeks from turning 62, and as you grow older, it takes longer to heal. Then he asked me what else I can do. Well, we have a little garden out front that needs tending... I can learn data entry in order to record the times and scores of people who use our gym.... I can still do some janitorial work, just no heavy lifting yet.... and since we are working on buying and refurbishing an old YMCA building not far from the shelter I live in, and since one of the things we're going to do is make a restaurant/cafe and have a rooftop garden, and everybody in my family has innate cooking skills, then there's writing....so he wrote all that down, then since I had previously shared a dream I had of living in the Antelope Valley and having a farm--yes, it has an agricultural community--he said he knew a pastor in Lancaster he could email, asking if he knew any farmers or ranchers who needed help. The only bad thing that has happened was this morning I discovered my cat Tripod's ashes were leaking. I'm going to have to get like a small train case to hold the box in. After fifteen years on Maui we decided to return to the Mainland. It boiled down to been there, done that, got the t-shirt. We're now in Southern Oregon. We left the Islands two days after the Big Island volcano blew up. Talk about timing. The biggest change has been getting use to the weather. It's colder at night and, lately, a lot hotter during the day. The humidity is quite a bit less too. The islands get vog from the volcano depending on which way the wind is blowing. It was clear here for the first month until the forest fires went off. We've had the worse air quality in the county for two weeks running. We've had to run the A/C for the last three weeks so the next power bill should be real interesting. 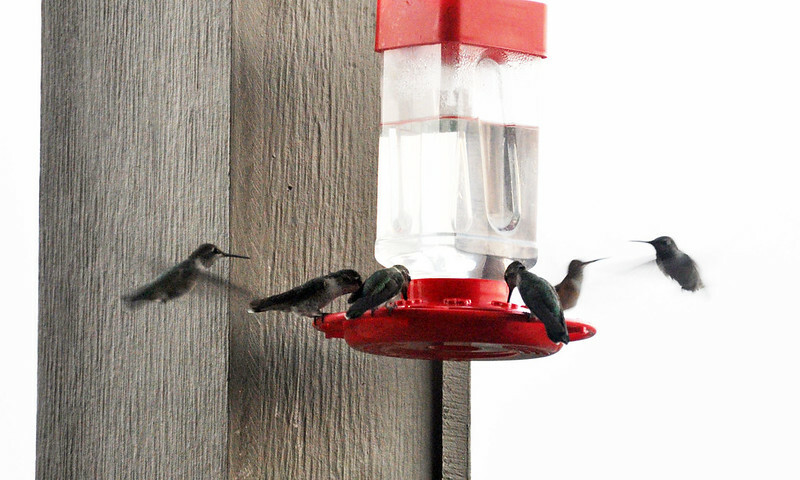 One thing my wife really missed was hummingbirds. She put out two feeders and it only took a week before we got birds showing up. At first she was refilling them about every three days. Lately, it's been every day. We think a bunch of babies have hatched and have joined their parents for the feed. She got a hand held feeder to see if she could attract any. She finally connected earlier today. How cool! I've never heard about the handheld ones. We've been having bedbugs especially in the women's section. The last couple of days they have taken our cots, taking out the stretcher bars on the ends, and putting the cots into a heat treating chamber for several hours. I was told to take my blankets to be washed, so I very intelligently put my name and bed number on the care labels of both my blankets. I asked where do we take them and was told by one person to put them in a black plastic bag, by another to the laundry area. Unfortunately, the latter was for donations. I managed to get the smaller of my two blankets back, but am looking for the other one. This morning there was further confusion regarding what we could get from our stuff and what we couldn't. I managed to get my shower stuff and clean clothes, but there was mass confusion regarding getting clothes from our bins. And later, even more confusion regarding whether we could put them back or not. It seems the lady who runs the place, Miss Doris, gives the orders but the rest of the staff interprets it differently. It took me awhile to get my shower this morning and put my dirty clothes back in my bin. I ended up losing 2 hours of time I could've spent online, etc. because the staff are all former tweakers, alcoholics or have mental health issues. While I support giving jobs to this population, they need to be monitored. Bad enough they steal from residents, but they can't figure out simple things. like instructions. We've been sleeping on mats on the floor for the last two nights. I hope I get my bed back soon--I've been looking for it but haven't seen it. I have some new duties at church. The ones from my original list of janitorial duties has been reduced to cobwebbing inside and out, dusting, especially the window sills, checking and restocking the bathrooms, getting the trash together and taking it to the dumpster, and picking up trash in the parking lot. New duties are scraping up gum out front, sweeping the two back patios and out front, and I have to get ahold of our office manager to learn how to scan stuff into the computer. They are also giving me the west end which used to be a play area when we had a preschool, to use as a "practice farm". One other thing that is on my list is to exterminate the gophers, but I tried doing that when the ground was wet, and discovered we have quite a bit of clay in our soil. First attempt did not go well. But this does mean I am getting home sooner, which is great. Oh, darn, forgot--also have to clean the refrigerators, too. Trying to remember everything on a short list, and between my aging brain and the heat there are going to be lapses. There's volcanoes up in the PNW too, but at least they don't erupt as often as they do in Hawaii. I'm neck deep in wedding and honeymoon plans. Trying to get the guest list together for the wedding so we can really start thinking about venues. We've been talking about doing a Beast theme to match the Beast themed proposal, but those kind of details are still wide open since there are still roughly 10 months before the wedding. I know it's going to come up quick so I'm trying to get as much done as possible.I'm hoping to have an inexpensive wedding so it will be easier to afford the huge honeymoon in the works. We've already decided that our wedding registry is going to be honeymoon funds because we don't really need stuff right now, and even if we got stuff we wouldn't have many places to put it. The honeymoon plans have expanded. Now we're going to swing by Reno for the convention we push to do every year, then fly down to Orlando for a few days to have a couple days at SeaWorld and a day at Discovery Cove. Then we'll be flying out to Barcelona for the cruise. I've already paid for most of the cruise so that part is pretty set in stone at least. We're currently discussing adding a few days at Disneyland on our way home; I've found that the flights from Barcelona to LAX to Salt Lake City combined are about $1000 cheaper than just flying home from Barcelona to Salt Lake City. We're already going to Disneyland in November and we're likely to go again in November next year so we could just get annual passes and use the cost for multiple visits. Everybody stay safe during hurricane season! Looks like it's gonna be a doozie this year! Norman and Olivia have ramped up from Tropical Storms to major hurricanes, as has Florence. Trick I learned from a MK Custodial CM: Take a spray bottle, fill it with crushed ice, and top with water. You spray this icewater on the gum to make it hard, and it pops off the pavement with a putty knife. Much nicer than using a solvent. Sorry I didn't notice in time to tell you earlier; been travelling again. Thanks for the tip, Zazu! We haven't gotten the Goo Gone yet, but we have plenty of ice!